Henry French, a judge and farmer in Concord, Massachusetts, who promoted the idea in an 1859 book about farm drainage. If you have a soggy yard or a wet basement, then a French drain is your cure. Here’s how they work, when to use them, the different types and cost. If you have a flat yard, you may need a deep French drain. Water always flows downhill, and by the easiest route possible. That’s the basic concept behind a French drain, a slightly sloped trench filled with round gravel and a pipe that diverts water away from your house. French drains provide an easy channel for water to flow through. Water runs into a gravel-filled trench, then into perforated pipe at the bottom of the trench. Water travels freely through the pipe, which empties a safe distance from the house. Install a shallow French drain. Also called a curtain drain, it extends horizontally across your property, directly uphill of the area you want to dry out. It intercepts water and channels it around the soggy spot. This type of drain doesn’t have to be very deep — a common size is 2 feet deep and 1.5 feet across. Where the drain passes through areas with trees or shrubs, switch to solid pipe (not perforated) to reduce the risk of roots growing into the piping and clogging it. 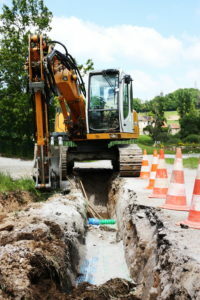 Install a deep French drain. Also called a footing drain, it runs around the perimeter of the house at the footing level and intercepts water before it can enter your basement. If there’s not enough slope for your drain system to work, you may need to pipe the collected water to a basin in the basement, where a sump pump can lift it and send it to the storm drain system. Install an interior French drain. An interior French drain intercepts water as it enters your basement — it’s the surest method of keeping your basement dry and a better option than a footing drain. However, if you have a finished basement, you’ll have to remove interior walls in order to install the system. That shouldn’t be a problem if water is ruining your basement anyway. Crews cut a channel around the perimeter of your basement floor, chip out the concrete, and install perforated pipe all the way around. The water flows to a collection tank sunk into the floor, and a sump pump sends it out to the yard or a storm drain. The channel is patched with a thin layer of concrete, except for a small gap at the edge to catch any water that dribbles down the wall.